Food Lists, Serving Sizes, and More! Trouble reading it? Scroll down for instant help. Want to print just the SANE grocery list from the eBook above? Want to print a checklist of the steps in your Step-By-Step program to help with tracking? 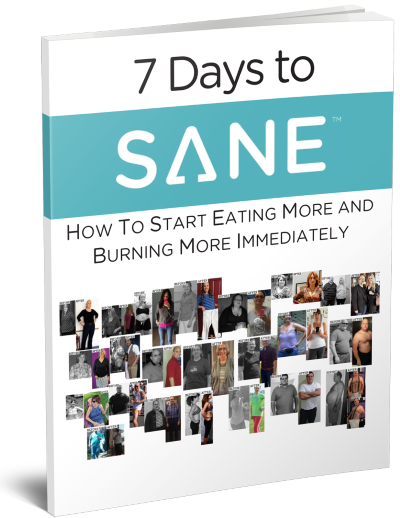 Want to see sample days of SANE eating? If you click “Read It” and nothing seems to happen, that’s because Android downloaded the ebook. You can enjoy it by going to your Downloads or My Files folder and opening the PDF. There is a bug in some versions of the Safari browser that blurs PDFs. You can avoid this by downloading a copy of the eBook and viewing it in Adobe Reader…OR…by using the Google Chrome or Firefox browser.